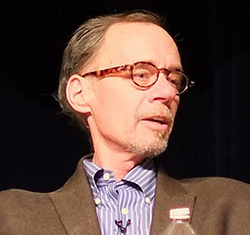 Syracuse University faculty and alumni are featured in “Remembering David Carr,” a documentary honoring the late New York Times journalist David Carr, scheduled to air on Friday, Aug. 28, at 10:30 p.m. on Public Broadcasting’s WNET. Professor Robert Thompson, director of the Newhouse School’s Bleier Center for Television and Popular Culture, and Mary Karr, Jesse Truesdell Peck Professor of Literature in the College of Arts and Sciences, are prominently featured in the tribute along with Stephen Colbert, Lena Dunham, Anthony Bourdain, Gay Talese, Dean Bacquet and Tom Arnold. Author, journalist and Syracuse University alumnus Ken Auletta also appears. David Carr was honored posthumously at the Newhouse School’s Mirror Awards this past June in New York City for his impact, innovation and influence in the field of journalism. For the past 25 years, Carr wrote about media as it intersects with business, culture and government. He was also the author of the memoir “The Night of the Gun” (Simon and Schuster, 2008). Produced by Syracuse University’s Office of Electronic Media Communications, the documentary will also air on WNET Sunday, Aug. 30, at 2 p.m. WNET Thirteen is PBS’s largest market, with its programming seen in the New York Metropolitan area, Connecticut, New Jersey, Long Island and parts of Pennsylvania. Central New York viewers will also get the opportunity to view “Remembering David Carr,” as WCNY will air the show this fall. The show’s producer and director, Stu Lisson, credits his staff and PBS with helping raise the profile of Syracuse University and its productions.